In 1878, Fielden N. Baker married Laura A. Smith in Newton, Catawba Co. Their daughter, Laura, was Bette Clarno's grandmother. This page traces what we know of Fielden (also known as Felix) and his parents and siblings. There are many trees on ancestry.com and other places which, I believe, show the wrong parents for Felix. Further down on this page, I discuss that. 1840 : Nathan and Susan Baker first appear in the 1840 census for Lower Regiment, Lincoln, Co., NC. Nathan was 30-39y, Susan was 20-29y and their son Harvey was 0-5y. 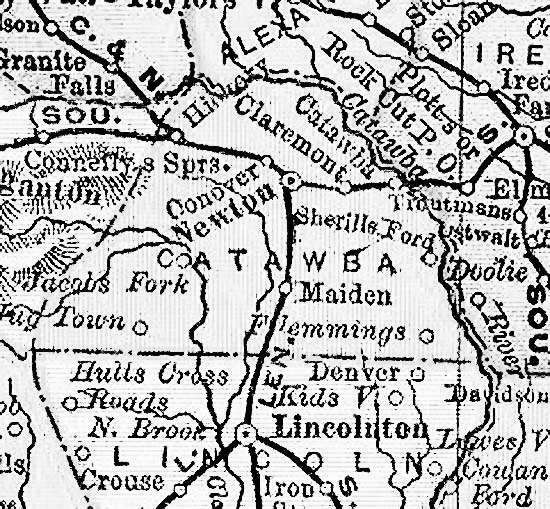 1842 : In 1842, Catawba County was formed from the northern part of Lincoln County. David was not listed and must have died. 1878 : Laura A. Smith married Felix Baker on 7 Feb 1878 in Newton, Catawba County. Felix was listed as "Fielden N. Baker". Laura was 19 years old and Felix was 23 years old (b 1805). Felix was from Lincoln County. Witnesses were E.M. Bollinger and Robert (or Rob) Baker. 1880 : By 1880, Nathan and family had moved to Lemley Township, Mecklenburg Co, NC. Nathan was 75y (b 1805) and Susan (listed as Susanna) was 65y (b 1815). Living with them were their granddaughter, Darkus E. Stevenson, 16y and their daughter, Isabella and her family. Isabella was 24y and had married James Crenshaw, 26y. They had a daughter Nora, 5y. Next door to them was Robert F. Baker, 22y and his wife Dora, 19y. They didn't have any children. This is Felix's younger brother. By 1880, Fielden (Felix), 23y, and Laura Smith, 20y, (married in 1878) lived in Hickory, Catawba Co, NC and had one son Harvey O., 1y. Living with Felix were Laura's mother, Eliza Smith, 47y, Laura's sister, Lon/Lori, 9y, and Polly Bollinger, 88y. Felix Baker and Laura Smith were Bette Baker's grandparents. In 1880, a person who I believe to be William Baker is married with 3 children, living in Gwaltney Township, Alexander Co, NC. A person who I believe to be Nancy Baker is married to a Womack and is living in Catawba Springs Township, Lincoln Co, NC. Now there is a 20 year gap in information about the family. The 1890 census was almost completely lost in a 10 Jan 1921 fire in the basement of the Commerce Building in Washington, DC. I've filled in here what I could deduce from later information. Felix died of cancer about 7 Sep 1897 in Loweville, Lincoln, NC. Laura and Felix's story continues in 1900 on this Page. Here are a few more details of Felix's siblings. 1910 : By 1910, Robert F. Baker, still married to Dora, has 4 children and is living in Coddle Creek Township, Iredell Co, NC. This is the same Robert who was a witness at the marriage of Felix and Laura in 1878. Susan unknown DC of son James Baker lists father's birthplace as Alexander County. NC. Nathan Baker unknown DC of son James Baker lists mother's birthplace as Alexander County. NC. Must be daughter of daughter Nancy. ?? ?? ?? ?? Stevenson? Mt. Holly, River Bend, Gaston, NC NC Death Certificate, married, listed as "J. W. Baker" DOB, birthplace as Lincoln County, reported by A. H. Baker (son, Avery), buried at Mt Holly, parents born in Alexander County. Son Avery H. Baker appears in 1900 census from Mountain Island Town, Gaston, NC. Wife Carrie and 4 children. Son Avery H. Baker appears in 1920 census from River Bend, Gaston, NC. Wife Carrie and 7 children. NOTE: there appears to be two Nathan N. Bakers. The other one was born in 1803, married a Susanna in 1844 and died in 1872 in Macon, IL. For example, this tree shows Felix' mother as Elizabeth. Definitely wrong as we seen Susan in the census. https://www.ancestry.com/family-tree/person/tree/2337779/person/-1219739892/story -- birth year 1771, need 1806. Nathan Baker was born in 1771 in North Carolina, the son of Margaret and Michael. He married Elizabeth Aston in 1792. They had two children during their marriage. He died in 1824 in Murfreesboro, Tennessee, at the age of 53. When Elizabeth Aston was born in 1768 in North Carolina, her father, James, was 58, and her mother, Mary, was 48. She married Nathan Baker in 1792. They had two children during their marriage. She died in 1844 in Illinois having lived a long life of 76 years. https://www.ancestry.com/family-tree/person/tree/108839509/person/110072864525/story -- birth year 1771, need 1806. When Nathan Baker was born on June 20, 1771, in Lincoln, North Carolina, his father, Michael, was 21 and his mother, Margaret, was 8. He married Elizabeth Elder "Betsy" Aston in 1792. They had eight children in 24 years. He died on September 22, 1824, in Murfreesboro, Tennessee, at the age of 53. When Elizabeth Elder "Betsy" Aston was born on January 25, 1768, her father, James, was 58, and her mother, Mary, was 48. She married Nathan Baker in 1792. They had eight children in 24 years. She died on September 26, 1844, in Macon, Illinois, having lived a long life of 76 years.